jQuery DataTables only supports COLSPAN or ROWSPAN attributes in table header as long as you have at least one header cell per column. See Complex headers (rowspan and colspan) example for more details and demonstration. Officially jQuery DataTables doesn’t support COLSPAN or ROWSPAN attributes for a cell in table body. There is a way to use ROWSPAN attribute with RowsGroup plugin, see jQuery DataTables: ROWSPAN in table body TBODY for more details and examples. The problem with COLSPAN attribute is that jQuery DataTables requires one TD element for each cell in table body. The solution is to include a TD node for each cell, use COLSPAN attribute on the first cell in a group and hide the remaining cells by applying display: none CSS style. The following code demonstrates how to to group 3 cells starting from the cell in the second column. 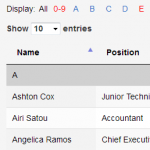 Please note that jQuery DataTables will use data in each individual cell to perform filtering and sorting. 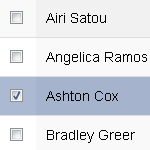 For example, sorting by Office or Age will show Ashton Cox as the first record because hidden cells in third and fourth columns contain no data. Either disable filtering and/or sorting or use appropriate data for hidden columns if this behavior is undesirable. I will use createdRow option to modify required cells when TR element is created in table body. The following code demonstrates how to to group 3 cells starting from the cell in the second column when data in the first column is Ashton Cox. // If name is "Ashton Cox"
It is possible to group cells both vertically and horizontally simultaneously if we combine workaround presented in this article with workaround for ROWSPAN attribute presented in jQuery DataTables: ROWSPAN in table body TBODY. I have disabled sorting and searching for all columns except the first one so that the secondary row with additional information always appears after the primary row and both primary and secondary row appear on the screen when table is searched. There is a room for improvements but I don’t want to overcomplicate this example. Below is the data for this example in JSON format. Grouping by name is possible because name is identical in both elements of the array representing primary and secondary row. I am using empty value in the “Office” column as an indication that grouping with COLSPAN is needed in the secondary row. Please leave a comment on how you are using these workarounds for COLSPAN or ROWSPAN attributes in your project. 1. At the bottom of table it shows “Showing 1 to 10 of 10 entries”. Is it possible to use the row group as the identity and count the number of row groups instead of the rows. For example, for this case, I would like to show “Showing 1 to 5 of 5 entries” base on the counting of row groups. 2. 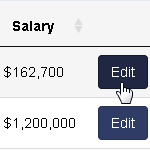 When I search by typing the key words that are included in columns “Position” to “Salary” in the search box, the result only shows the rows in which the key words are included. If I search by typing the person’s name, it returns the row group. Is it possible to show the row group no matter what key words are used? In other words, when I search for key words included in other columns than the first one, the returning results show the row group, not the specific single row. 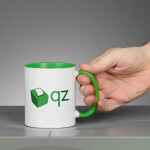 Thank you for your valuable blog. It works for me.